The Econ River Wilderness Area is comprised of 240 acres owned by Seminole County. 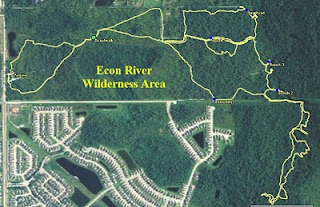 The only entrance or access point is located on Old Lockwood Road in Oviedo. Ample parking is available, as well as a trashcan and recycle bin. So please, consider practicing the motto of “Hiking in and Trashing Out”. 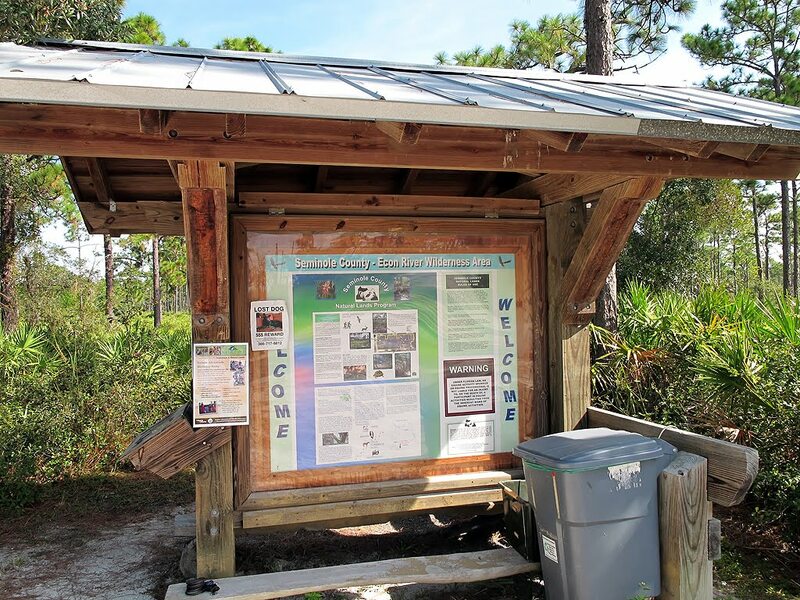 Visitors are welcomed by a kiosk located at the trailhead that is loaded with environmental information. A guest book is provided and visitors are encouraged to log what sort of wildlife they encountered. 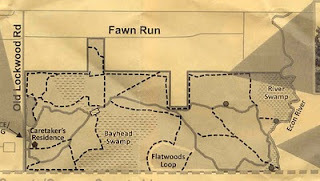 Pocket trail maps are also available. The trail entrance itself is well marked. The hiking trail is blazed with red metallic circles embossed with silver arrows; much thought and consideration went into planning this trail. 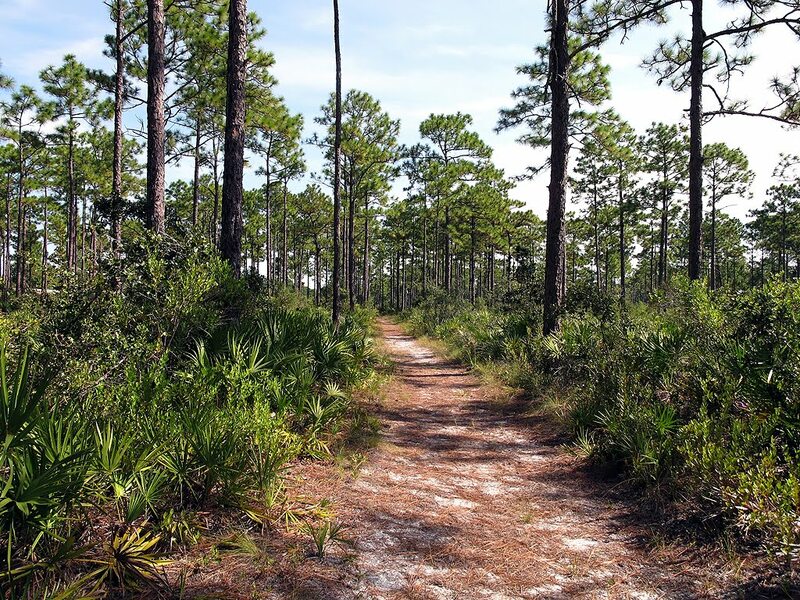 Hikers are intermittently offered shade and solitude within hammocks of oak and then sunshine and sand amongst tall narrow pine trees. At times the trail causes you to walk in single fill and other areas allow for side by side companionship and conversation. As you enter the area, look to your left and enjoy a very pretty pond. The day we visited, there were some beautiful water lilies floating on top of the deep blue water. At the beginning of the trail you will encounter the first of many ecosystems found throughout the area. 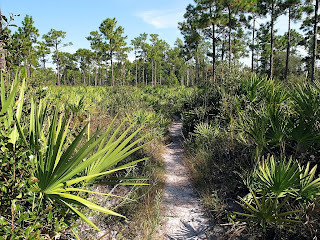 This section of the park consists of mostly saw palmettos. 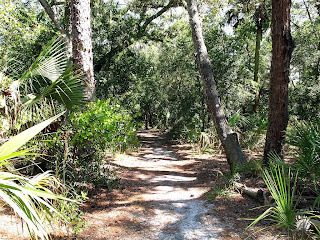 As you proceed down the well-marked trail you will find a small boardwalk provided for convenience during the rainy season. I’m told that during wet times, hikers can expect some of the trail to be quite wet. From here the trail now winds into a beautiful oak hammock. Benches have been strategically placed to satisfy your feet and your five senses. 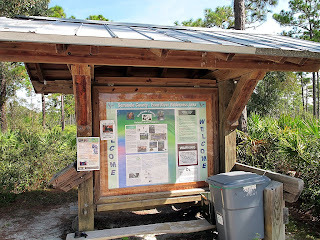 The first of three benches is in this area so take advantage of it; listen to the sounds, watch for wildlife, smell the fresh air and enjoy the taste of your favorite drink. As you meander you will encounter some very pretty wildflowers, as well as some of the local wildlife. Look up from time to time and catch sight of our fine feathered friends, various bird houses and an occasional bat house are visible in many trees. 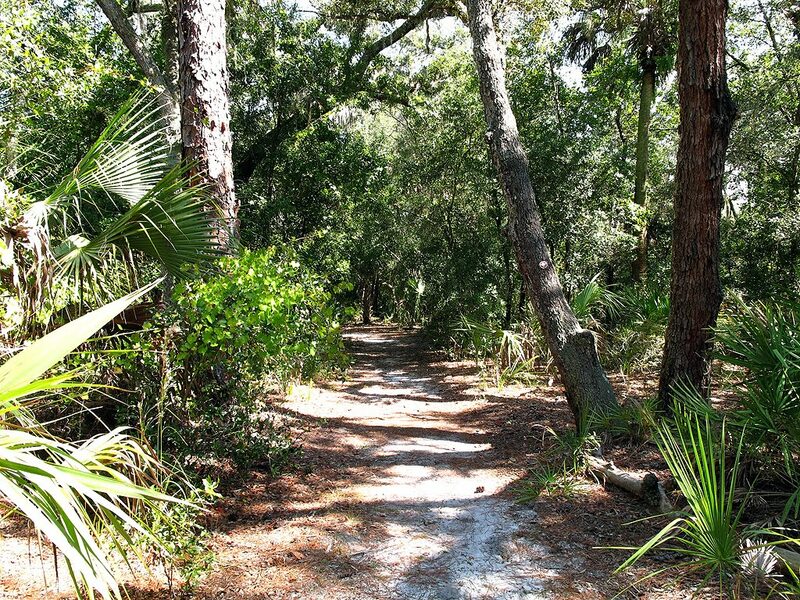 The trail will now wind down to the Econlockhatchee River providing you with pretty views and ample photo opportunities. Once again, the county has provided benches for you to relax and enjoy the cypress trees and their artistic knees. I find cypress trees to be one of the prettiest trees in Florida. Nature also provides you with a variety of flora and fauna. 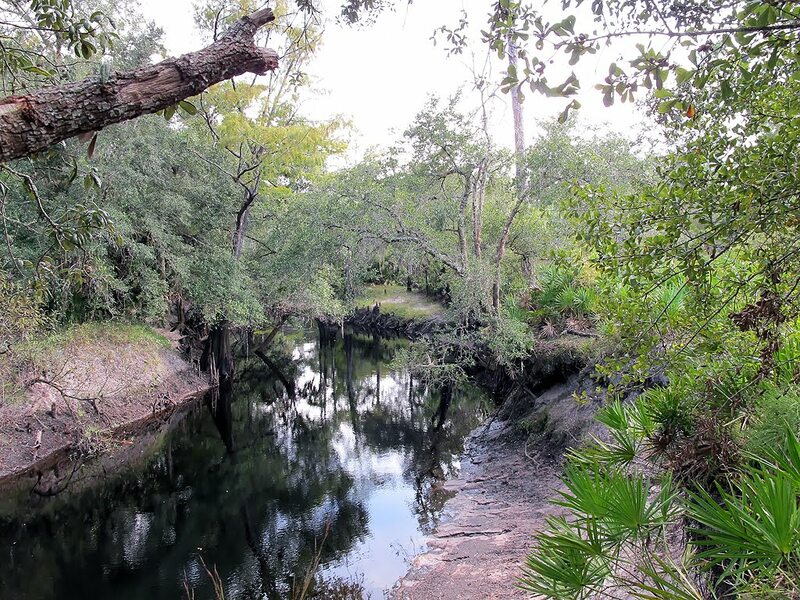 Sit back, watch the water flow past and enjoy the peaceful sway of wispy tall grasses in the breeze. I highly recommend spending some quality time down here. At this point you can elect to double back using one of the available trails or if the conditions are favorable, venture down the river to see more of the river area. We ventured down the river to observe the glorious cypress and other trees along the river. As I stated, you only want to try this during the dry season, as this area can get quite muddy and wet at times. This part of the river is controlled by the SJRWMD and as far as I know you can visit that area. 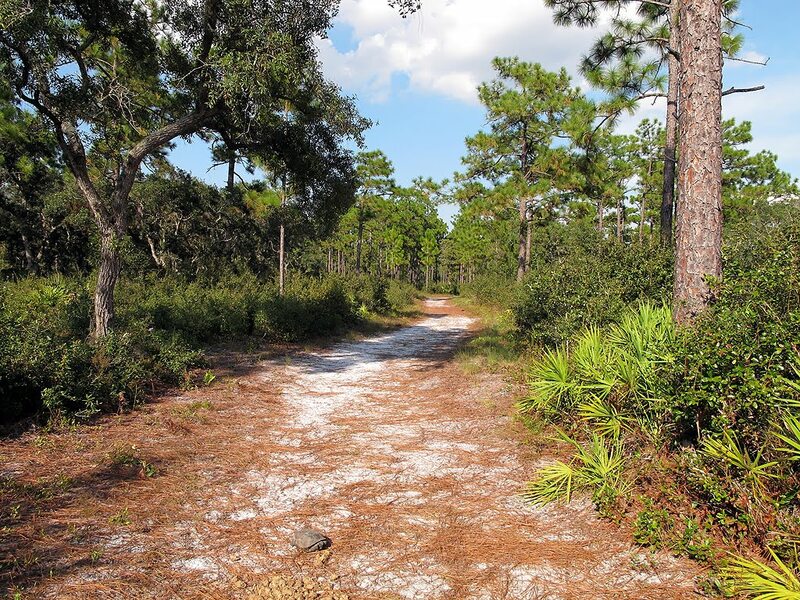 The brochure provided by the county states that this 240-acre area is made up of oak hammocks, pine flatwoods and sandhill habitats. 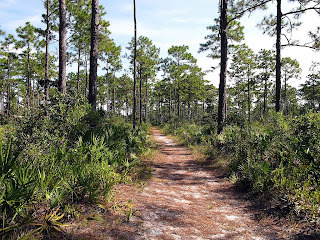 The blazed trail system is approximately 3 miles long. They do allow horses in the area, but there is no parking available for horse trailers. 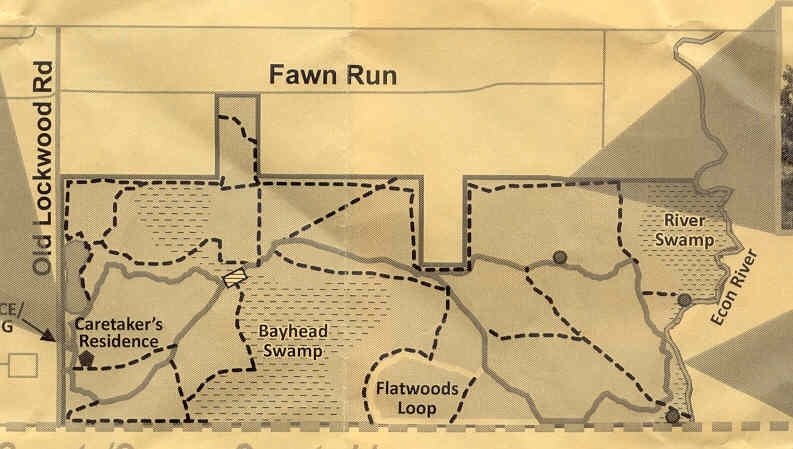 The main loop trail is blazed red (about 2.2 miles) with a secondary flatwoods loop blazed in yellow (.5). We hiked 6.4 miles around the area and river the day we visited. There are a couple of GEOCaches in the area if you’re into that.